It is that time of year again. As we near the end of the Supreme Court term, we are experiencing another round of prognostications on whether Justice Kennedy will retire leaving another vacancy for the Trump Administration to fill (last year’s take on the possibility of Kennedy’s retirement can be found here). About this time of year in 2017, the headlines ranged from describing the potential dire consequences, mystery, and effects such a vacancy would propagate. This year pundits on the left and right are forecasting along similar lines. Kennedy, the second oldest justice on the Court at 81 years of old (Justice Ginsburg is 85), is at an age where retirement is not only reasonable but should be expected. This is not to say he will retire this year or anytime in the imminent future. 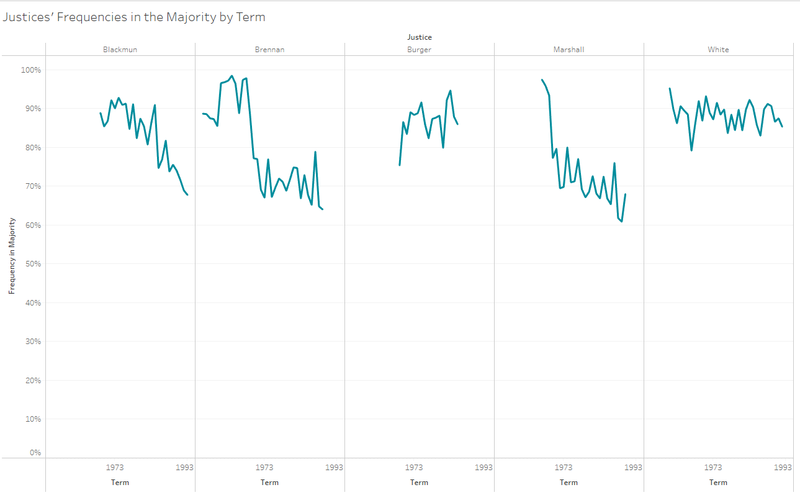 Across the history of the Supreme Court the two oldest justices to leave the Court – Justices Holmes and Stevens – did so at the age of 90 [Prof. Lee Epstein’s Supreme Court Justices Dataset is a main resource used for justices’ age-related data]. Both retired from the bench. On the other end of the spectrum, Justice Curtis was the youngest justice ever to retire at the age of 47, although he did so in 1857. Focusing on justices that joined the Court after the beginning of the 20th century, Justice Rutledge was the youngest justice to depart the Court as he died while still a member of the Court in 1949 at the age of 55. Justice Moody was the youngest to retire after the beginning of the 20th century at the age of 56 in 1910. 55 justices retired from the Court since it was established in 1789 and 35 justices retired from the Court since 1900. For this group, the average age at retirement is 73.6 or between seven and eight years younger than Kennedy’s current age. This all goes to show that Justice Kennedy’s departure would hardly be unexpected based on the Court’s history. To probe a bit deeper, how better to get a sense of the likelihood that Justice Kennedy departs than by looking at the Court’s previous retirees? Nine justices retired between and including Justice Burger in 1986 and the most recent retirement of Justice Stevens in 2010. 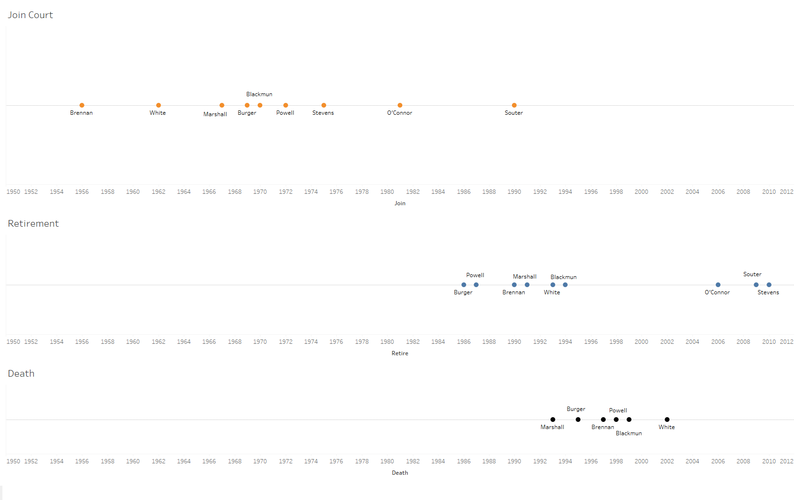 The figure below looks at three timelines that track when these nine justices joined the Court, retired, and passed away for those not still living. If Kennedy were to retire at the end of this term his placement on such a timeline would not look anomalous. The retirees can be split along many different dimensions. One such fault line used in this post is between “content retirees” and “discontent retirees.” While both types of justices may retire, a justice’s relative contentment and the immediacy or urgency of their intended retirement along with how this effects their perception of the balance of the Court upon the justice’s departure may heavily influence a justice’s decision. According to individual disagreement measures, Justice Kennedy should be quite satisfied with his place on the Court. The measures that convey this are his dissents in cases decided by one vote and his dissenting frequency last term (the last term prior to retirement is used for all other justices). 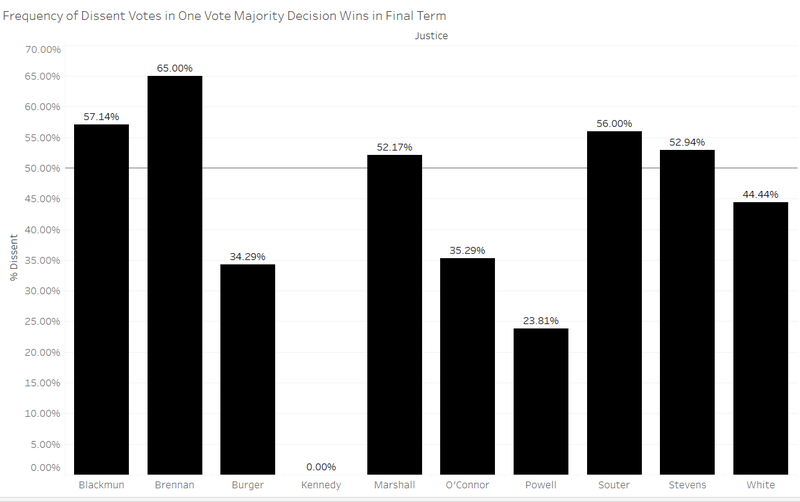 The first suggestion that Justice Kennedy should be satisfied with his place on the Court comes from his lack of dissents in cases decided by one vote last term. The second measure is overall dissent frequency. So far this term Justice Kennedy dissented four times or in about 13% of the signed decisions. 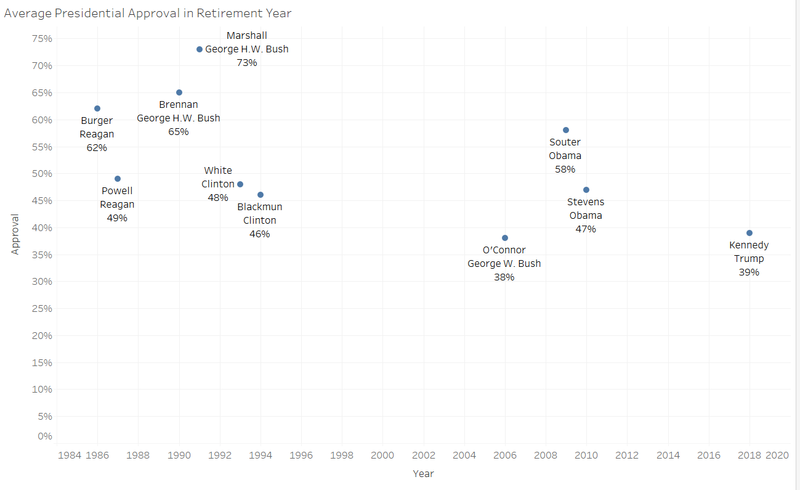 Based on last term though his dissent frequency was also lower than any of the last nine retirees in their final full terms. Similar to the previous figure, there is a large disparity between the justices on the conservative and liberal ends of the spectrum. Although Justice Kennedy’s frequency dissenting across the 2016 term is far below any of the justices pictured above, his current frequency for the 2017 term is in line with the dissent frequencies of the four more conservative justices. The second set of analyses look at the question of contentment from the opposite perspective – that of how well the justices agreed with the Court’s majority. Justice Kennedy has been one of the Court’s most frequent members in the majority over the last several terms. 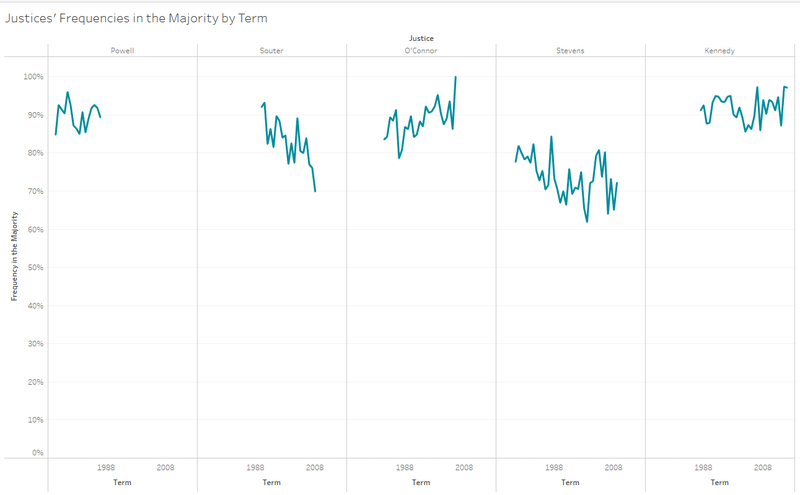 Justice Kennedy’s frequency in the majority has hovered at about the 90% level across his career on the Supreme Court. The more liberal justices’ frequencies tend to fall well below this marker while the more conservative justices are all in a similar range. Looking at the retiring justices’ agreement levels with the other justices on the Court in their final terms shows a similar distinction between more and less contented justices. 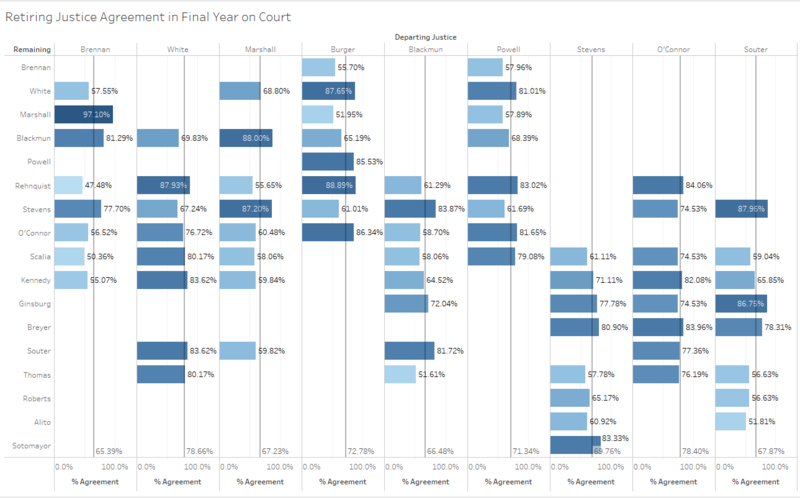 Note that the darker bars in the figure below correspond with higher agreement levels and the gray lines are the retiring justices’ average agreement levels for the term. Justice White had the highest average agreement level at 78.66%. Similar to the previous figures, the more liberal justices in this figure are all below the 70% average agreement level while the more conservative justices’ levels are all above the 70% mark. Per SCOTUSBlog’s statistics for the 2016 term, Kennedy agreed with all justices aside from Justice Thomas at least 80% of the time. If justices are concerned with the potential consequences of their retirement and the future direction of the Court then they may care about specific retirement timing. This theory known as strategic retirement posits that justices care about the president in office when they retire because the president ultimately makes the decision on who to nominate to fill their seat. Two aspects that might play a role in the justices’ decisions are whether their policy preferences accord with those of the sitting president and whether the public has a favorable view of the president. Professor Michael Bailey’s data bridges presidents’ ideology scores with those for Supreme Court justices. These data, which go through the 2007 Supreme Court term, provide additional insight into the justices’ strategic decision making. 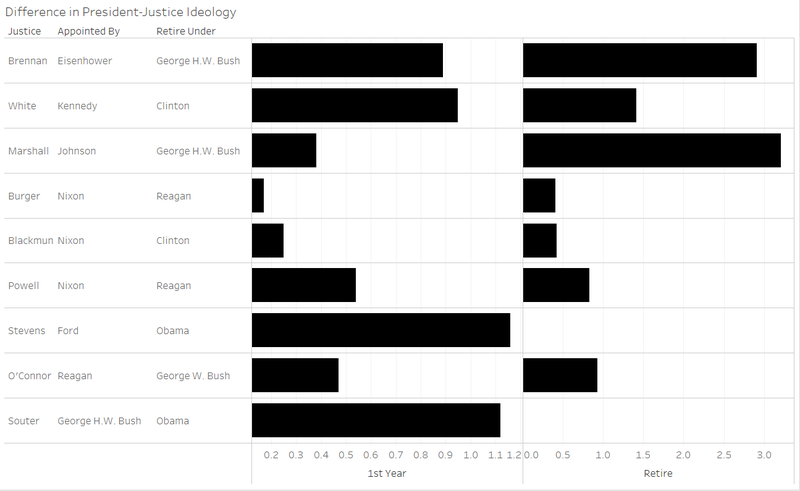 The figure below looks at the absolute difference between the appointing president’s ideology and the justice’s ideology in the first year on the Court and then between the president’s ideology upon their departure and the justice’s ideology in their final term on the Court. The most important calculation here is the difference in relative ideology upon retirement. Most justices in the figure above retired with low relative absolute differences in ideology scores. Justice Marshall who had the highest difference in score upon his retirement was already in declining health when he left the Court and was primarily a member of the Court’s dissenting coalitions at that time. Even though Justices Stevens and Souter do not have available scores for the years of their retirements, both tended to vote on the liberal end of the spectrum and both retired under President Obama, and so neither would likely have had a great absolute difference in ideology from the president upon their retirements. A final measure looks at the president’s approval rating at the time of the justice’s retirement as a marker of a president’s strength in office, which may influence a justice’s retirement decision timing. 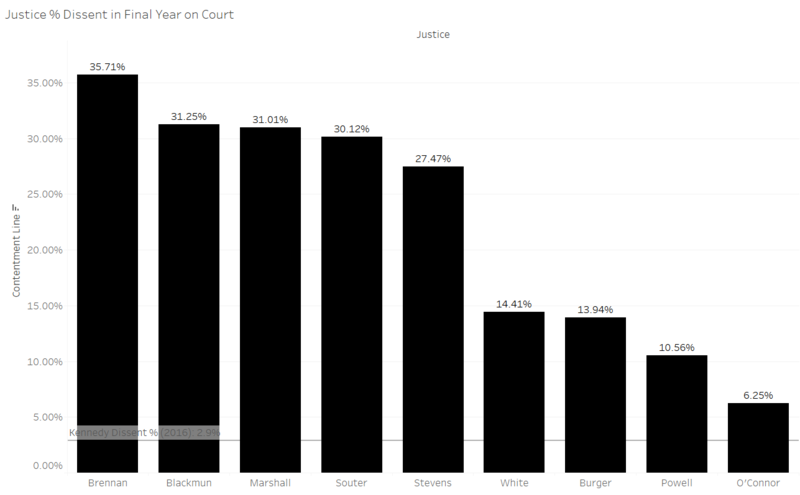 The approval data comes from the UCSB Presidential project and is averaged across the president’s approval rating for the justice’s last year on the Court (the data for Kennedy is President Trump’s average approval so far in 2018). If Justice Kennedy were to retire right now, he would retire under the second lowest average presidential approval level for the justices measured in this post as only President George W. Bush’s approval rating in 2006 was lower. The rest of the justices retired under presidents with at least a 40% average approval rating in the justice’s final year suggesting a potential albeit tenuous relationship that may factor into a justice’s calculus. Some justices don’t have the luxury of choosing when to retire while others can be more strategic about their decisions. Going back to the first figure in the post, Justice Marshall passed away merely two years after retiring, which shows that even if did not retire when he did, he would not have been an active member of the Court for much longer. Justice O’Connor would have retired earlier than she did to take care of her ailing husband had Justice Rehnquist not passed away when he did. Others like Souter who retired at an early age could be more cautious about when to retire and in what political environment. Right now as far as we know Justice Kennedy is in good health (although as this report from Fix the Court indicates, the justices are often not transparent with their current health statuses). If we presume that content justices in good health are more likely to stay on the Court, especially when their ideologies do not correlate with those of the incumbent president, then signs point to Justice Kennedy remaining on the Court past this term notwithstanding all of the discussion surrounding his retirement (assuming President Trumps views do not align with those of Justice Kennedy). Kennedy might also be wary that the center of the Court will almost assuredly shift to the right if he leaves at the end of the term. Although based on his age and tenure on the Court Kennedy is not likely to remain on the Court much longer, it may well be in his interest to stay put for now. Pingback: Lawyers Planet | Empirical SCOTUS: A seismic shift?